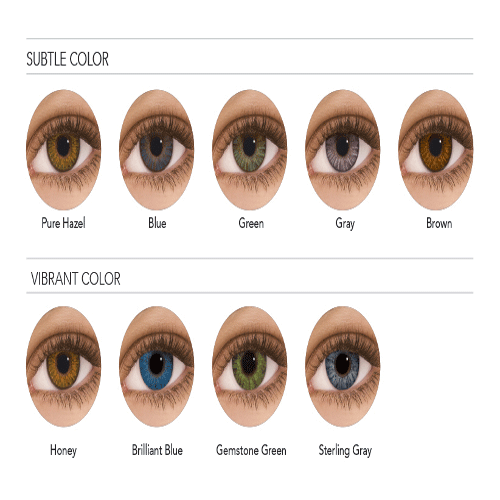 AIR OPTIX® COLORS contact lenses feature the same vision and comfort technology as your regular Air Optic Aqua contact lenses– but with a choice of 9 stunning colours to redefine your look. You can already express your unique personality through the clothes, accessories and makeup you wear. Now, changing your eye colour can be one more way to show off your style. Whether you want to express cool confidence or sophisticated warmth, AIR OPTIX® COLORS contact lenses can help you turn your eyes into your best feature. Featuring proprietary 3-in-1 colour technology, AIR OPTIX® COLORS contact lenses are designed to enhance dark or light eyes, with a completely natural effect. Combining the advanced AIR OPTIX® AQUA comfort technology with stunningly beautiful colour, AIR OPTIX® COLORS breathable contact lenses allow you to enjoy comfortable contact lenses that feel as good as they look. AIR OPTIX® COLORS brings together comfort, breathability and beauty like never before – choose a colour today that brings the best out in you! Dailies Total 1 is the latest contact lens from Ciba Vision/Alcon.